How and Where to Buy Flovent Inhaler Online? Here at www.CanadianPharmacyWorld.com, we carry the brand name Flovent HFA inhaler, manufactured by GlaxoSmithKline (GSK). To place your order online with us, you will need a valid prescription. If you’d like to speak with someone about your order, you can also dial 1-866-485-7979 and someone will be able to assist you. For more information about our Online Canadian Pharmacy, please click on About Us. Are there Alternative Names for the Brand and Generic Flovent HFA? The brand name inhaler is known as Flovent HFA. The generic equivalent goes by fluticasone inhalation, and it is also manufactured under brand names such as Arnuity Ellipta, and Flovent Diskus. What Dosages and Forms is Flovent Inhaler available in? 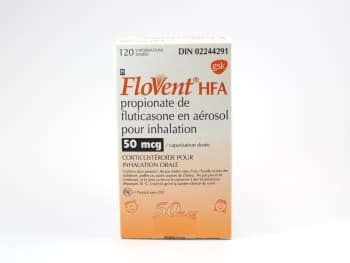 At Canadian Pharmacy World, we carry the brand name Flovent HFA, in a 50 mcg/120 dose, a 125 mcg/120 dose, and a 250 mcg/120 dose. What is Flovent Inhaler used for? Flovent is a steroidal maintenance inhaler used to prevent asthma attacks brought on by inflammation. This is not a rescue inhaler, and isn’t used to treat an asthma attack once it has already begun. Depending on the severity of the inflammation, Flovent is sometimes paired with an oral steroid to increase its effectiveness. What are the Possible Side Effects of Flovent Inhaler? Before deciding if Flovent HFA is right for you, it’s important to note that most medications will come with a few side effects. Let’s take a closer look at what you might expect. Are there any Precautions and Drug interactions of Flovent Inhaler? You should not use the Flovent HFA if you are allergic to fluticasone, or if you’re allergic to milk proteins. Also, avoid being around people who have chicken pox or measles, as these conditions could be serious and/or fatal for those using steroidal medications. Store Flovent HFA at room temperature away from extreme heat, moisture, and light. Be sure to store the opened inhaler canister with the mouthpiece down. Do not store in a vehicle, as the canister may explode if it gets too hot. Do not puncture or burn the empty canister. This inhaler is not intended for anyone younger than four-years-old, as fluticasone can affect growth in children. Overdose symptoms can include: dry mouth, tremors, chest pain, fast heartbeats, nausea, general ill feeling, seizures, feeling light-headed, and/or fainting. If you suspect an overdose, seek immediate emergency help or call Poison Control at 1-800-463-5060.